Providing enough safe and nutritious food for a globally expanding population in the light of climate change and limited resources is a serious challenge which needs to be addressed over the next few years. There are many dimensions to this problem which include environmental, biological, social, political, economic and behavioural issues all of which need to be overcome. In 2013 the University invested in a number of posts in Aquatic Food Security, including my own position, and we quickly developed a new MSc programme and set up the Centre for Aquatic Food Security. The Centre is focussed on Aquatic Food Security since that builds on our strengths in Aquaculture and aquatic food production. However, when we think of global food security there are interactions between all of the food production systems and the Centre has members from across the University who work on many different aspects of food security and the food system. One of the aims of the centre is therefore to bring together a range of disciplines to work together to address “big picture” questions in food security. We have been involved in a number of interesting activities over the last few years building networks and developing project ideas and applications. Last year, I led a project funded by the Scottish Universities Insight Institute (SUII), to run a Knowledge Exchange programme titled Problems and solutions in food security – from surf to turf, involving a series of workshops and a final report. We ran 5 workshops, which were very valuable and allowed the project team to identify common areas of research and collaboration between aquaculture and crop systems – I blogged about those outcomes for the Global Food Security blog. SUII encouraged us to capture our discussions in interesting ways and as a result we now have visual and reusable outputs that communicate our research and the discussions in an engaging fashion – video at the first meeting that captured what workshop attendees learnt and a graphic recorder, Nick Payne, to capture our discussions at the workshops, which I can thoroughly recommend. One of our key recommendations from surf to turf was that we have lots of expertise across the whole breadth of food security in Scotland and that there is an opportunity here to consolidate expertise across food systems locally and then transfer that knowledge to the appropriate places globally. Following the project, we identified a number of ways to make that happen and look forward to taking these ways forward. Another exciting project that we have been working on this year began life funded by an Interface-administered Innovation Voucher working with a company called Fishbox. Fishbox is a seafood subscription service in which fresh and seasonal fish is delivered straight to your door. 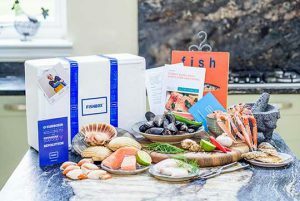 The process involves, customers choosing their loves, likes and dislikes from amongst 80 products, Fishbox sees what is fresh and in market and, based on customer preferences, sends an appropriate box (all sealed, fresh and secure so you can have it delivered to work and not worry about leaks or smells!). Currently, the fish allocation is currently done by hand but the company has grown from 40 customers two years ago to 1500+ and so the packing is much more challenging. Our interface project working with Fishbox involved developing an algorithm which allows their packing to operate more quickly and efficiently by allocating products algorithmically and producing a shopping list for the packers which reduces waste whilst still satisfying customer needs. Fishbox ticks all of the boxes as a sustainable solution to aquatic food security, an Msc project this summer found that compared to customers who bought their fish directly from the supermarket, Fishbox customers were encouraged to eat seafood more frequently and to eat a more diverse range of species – read my blog for Fishbox to find out more on how fishbox is a sustainable solution to Aquatic Food security. It has been great fun working with Fishbox, who are full of ideas and innovations and we are hoping to continue to find opportunities to collaborate with them over the coming years. 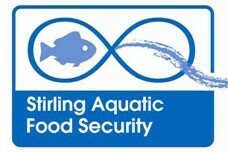 The centre for Aquatic Food Security at Stirling have had a busy first few years with a number of impactful, interdisciplinary projects being developed. Food security is a challenging and complex problem, but I cannot wait to get my teeth into new projects and to keep working with the brilliant team that makes up the Centre for Aquatic Food Security. If anyone has an interest in Food Security generally and would like to be put on our email list then please get in touch.